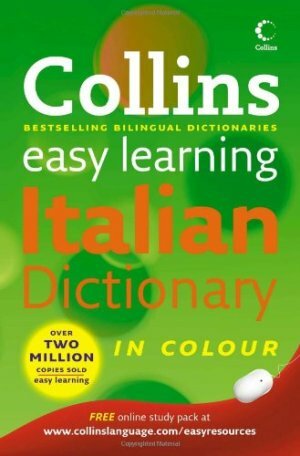 Collins Easy Learning Italian Dictionary is an up-to-date, easy-reference dictionary with practical and fun supplements, ideal for learners of Italian of all ages. Collins Easy Learning Italian Dictionary is designed for anyone of any age who is starting to learn Italian. The entries cover everyday Italian and English, including all essential set expressions, so you can be sure of having all the vocabulary you need. The dictionary also offers additional help in the form of a full guide to using the dictionary, essential grammar pages and a section on expressing yourself in Italian and English. With warnings on the most common errors and confusable words, the Collins Easy Learning Italian Dictionary gives a solid foundation for Italian language learning. / Get it right: translations shown in examples to show you how to really use Italian. / Get there fast: new, clear Collins typography and colour lookup take you quickly to the words you want, with all the most important words flagged for rapid identification. / Have confidence: a fun, practical supplement helping you use written and spoken Italian correctly. Other titles available in the Collins Italian Easy Learning range are Collins Easy Learning Italian Verbs, Collins Easy Learning Italian Grammar and Collins Easy Learning Italian Conversation -- giving learners all the help they need in every aspect of language learning.